I made all three recipes in one go (an experience I recommend to no one) and the next morning I was so shattered I could barely get out of bed. 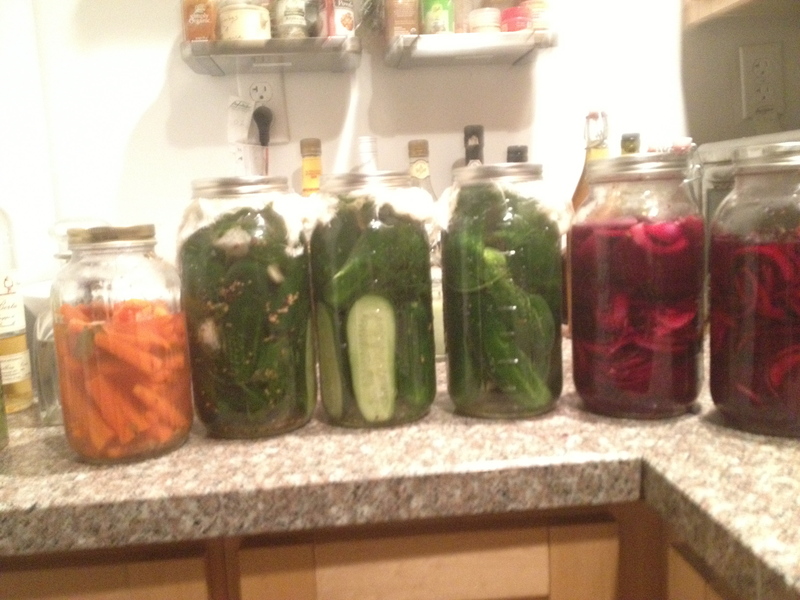 So do space your pickling experiences a day or so apart. Death by pickling would be a good band name, but not something you’d want written in your obituary. 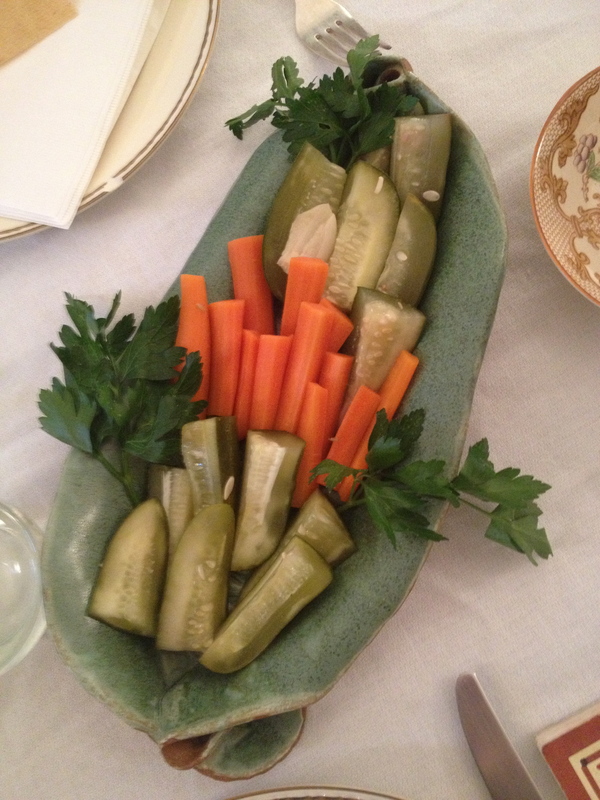 It is a sad fact that Kirby cucumbers are not in season come Passover. The ones I got were decent, but not ideal. All the same, they’re better than any pickle you’ll get in a store. This recipe makes a decent dilled pickle, but they’re neither sour nor as salty as the store bought kind. Bring one liter of water to a boil with the salt and stir until the salt dissolves. Remove the pot from the heat and add the remaining water. Prepare three one-liter wide mouth jars by running them through the dishwasher or sterilizing them in a water bath canner. Pack the cucumbers into the jars standing up. You may need to stack them with the jars on their sides to get them to fit in. They will fit in tightly. As you add the cucumbers, divide the remaining ingredients (dill, garlic, spices, and bay leaves.) Be sure to add the pickles and the spicing simultaneously as the pickles fit so tightly you will not be able to add many ingredients when the jars are full. Pour the brine you’ve just prepared into the jars so that the vegetables are completely covered. Cover the jars with cheesecloth and secure them with their metal rings. Store them in a cool dark place (I used an empty shelf) for three days. The brine creates a mighty aroma, so don’t go putting them anywhere you don’t want to smell like pickle juice. After three days, refrigerate. 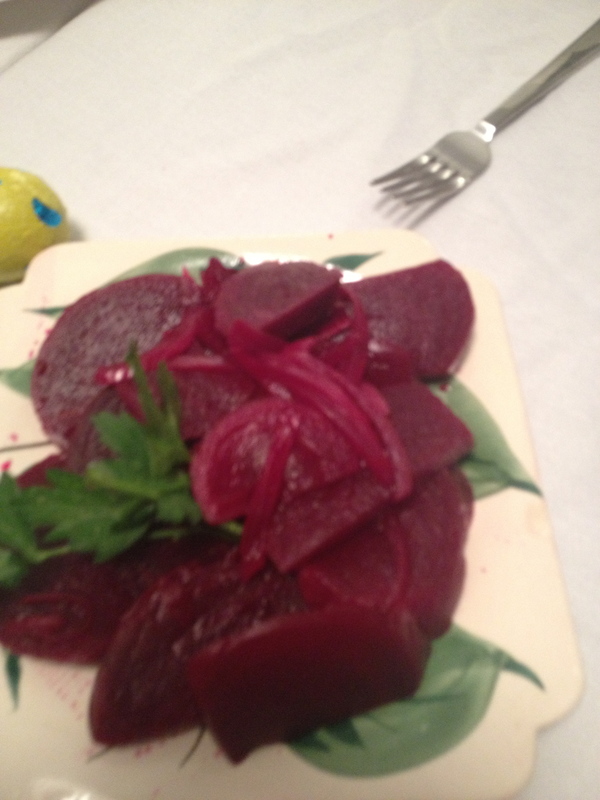 There’s something wicked about the pickled beet. The stubby root vegetable that takes on gem-like colors when cooked and bleeds onto your plate like an alien sea creature. Left to their own devices I imagine them hopping out of their jars and latching onto our heads to transform us into hosts for the beet mind collective. Creepy, yes, but no pickle is as seductive. 1 onion, cut into quarters. While the beets are cooking, sterilize your jar by running it through the dishwasher. Once the beets are cooked (you’ll know they’re cooked once they’ve taken on that unmistakable gem-like color when cut open and can easily be pierced with a fork) allow them to cool and then peel off their skins. Slice beets thinly and place in your prepared one-quart jar, alternating them in layers with your red onion slices. In a pot boil together the vinegar, sugar, and water and pour the liquid over the beets. Refrigerate for three to five days before serving. Light and easy going, brightly colored and punched with sweetness, the carrot needs little that it doesn’t already have. Pickling the carrot may seem a bit like gilding the lily, yet, there is something democratizing about brine: it places all vegetables in common, the mighty carrot beside the lumpy beet. When you bite into them the satisfying crunch of the carrot is followed by the toothsome kick of the pickle. They’ll satisfy taste buds you never knew you had. Peel and cut the carrots into two-inch long sticks. You don’t need to be too precise so long as the carrots are mostly all the same size. Bring a pot of lightly salted water to a boil and blanche the carrots for one minute. Drain the carrots and run them under cold water. Heat the other ingredients together. Once at a boil simmer for two minutes, remove from heat and add carrot sticks. Once the liquid is cool, pour into a prepared sterilized jar and refrigerate. Carrots will be ready the next day and will keep in the refrigerator for up to a month. 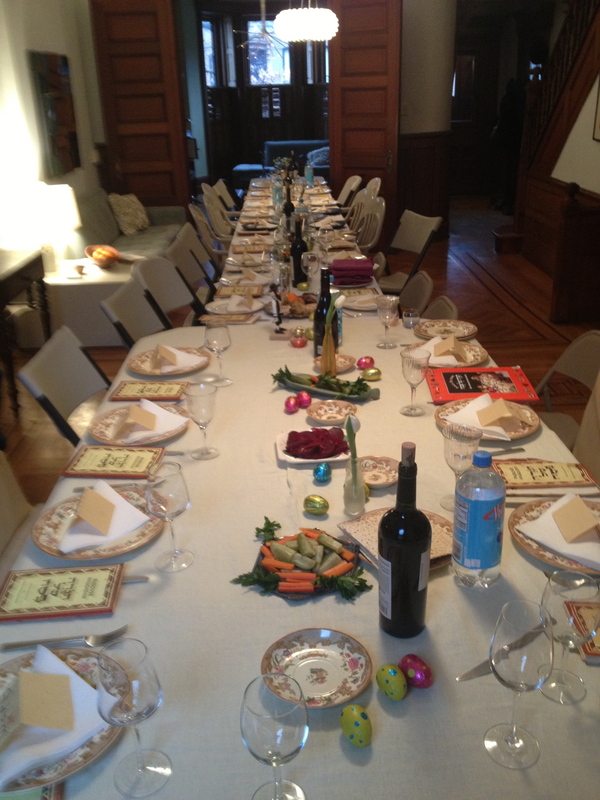 This entry was tagged Brine, Passover, Pickled cucumber, Pickling. Bookmark the permalink. You’re so welcome! Thanks for visiting! Looks easy and accessible, looking forward to trying the carrots in particular but how many do you need for the recipe? Thanks for commenting! You use a pound of carrots. They’re delicious. Making fermented pickled carrots right now. How do I convert it to actual water bath canning so they can have a shelf life of months? Do you have that recipe? 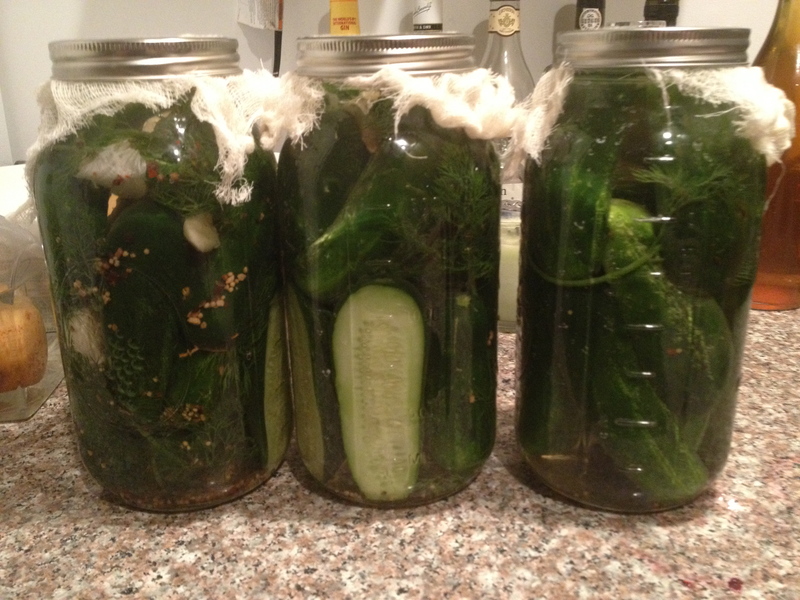 Once the cucumbers have been fermented they can stay in the fridge for many months. Water bath canning will actually kill the microbes created during the lacto-fermentation process. As for the others, I don’t have specific recipes, but I find this home preservation website very useful: http://nchfp.uga.edu/how/can_home.html.